Whether you are raising to support your child’s school, or another of the 8000+ worthy causes on our site, it’s important to be aware of the key periods in the calendar that offer the best opportunities to boost donations. 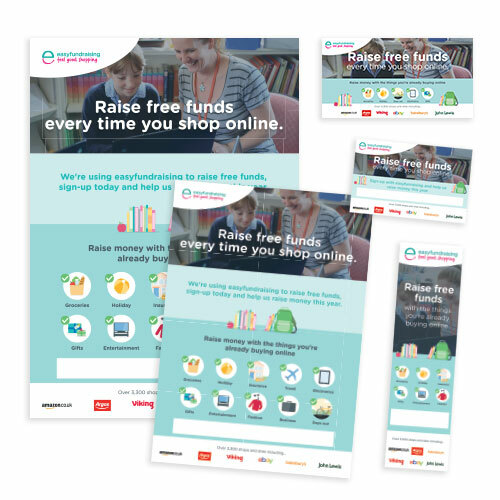 One of these periods is the back to school season – this is just around the corner, so it’s the perfect time to increase your shopping activity with easyfundraising, and to encourage your fellow parents – as well as friends, family and colleagues – to do the same. We all dread the challenge of back to school shopping but the arduous task of buying everything your kids need with easyfundraising does have a silver lining – as you’ll be raising valuable funds for your good cause too. From uniform to sports kit to stationery to tech – your donations will build up quickly, and before you know it, you will have raised a substantial sum. An average parent will raise around £5 when they do all their back-to-school shopping with easyfundraising. Over the course of a year, they could raise as much as £200. Multiply that sum by the number of children in your school, and you’ll see just what a huge opportunity there is, and why it’s so important to promote easyfundraising to parents. If you can persuade every parent at your school to get on board, the size of the prize could be very significant indeed. The Promote My cause Section of our website is packed full of resources designed to make things easier, raise as much as possible, and make a real difference to your cause. One of the best ways of boosting donations is to ensure that you share the link to your cause page on social media and email, and print it on your posters, flyers, handouts and everything else you use to promote it, as this takes supporters straight to a screen where they can sign up and start raising straight away. We’ve made it easier to spread the word by writing some social media (Facebook, Twitter, and WhatsApp) posts for you to share with your supporters, plus pre-written email and newsletter copy for you to tweak and send. Utilise the huge power of social media over the summer, and galvanise your supporters, friends, and family to take advantage of the back to school season to raise as much as possible for the good cause closest to your heart. We’ve written an easy to follow guide to show you how you can quickly and simply create a dedicated fundraising page on your website, with examples of other sites for inspiration. Be sure to add a link to the easyfundraising page very clearly in your website’s navigation to guarantee that supporters can arrive there in just a couple of clicks. To make things even easier, we’ve included free banners, retailer logos and the easyfundraising logo to inspire supporters to get raising. Posters, flyers, and handouts are a great way to make an impact. We have designed these in A3, A4, and A5 – meaning that you can pick out the perfect resource to suit your campaign. The smaller flyers and handout cards and bookmarks are perfect to pop in the kid’s bookbags at the end of a school day – and have proved very popular with parents.